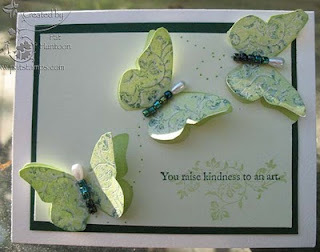 Today I am participating in the Creative Cuts and more Blog Hop! Welcome to the Celebration Blog Hop for Creative Cuts and More's NEW Website! You are in for a GREAT treat! We have TONS of VERY Talented Designers that came to join us for this special HOP! If you have arrived from Kim Howard's Blog you are in the right place. 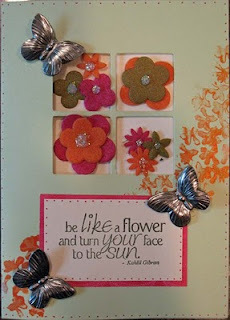 If you have not arrived from Kim's Blog you may want to start the blog hop here at the Creative Cuts and More blog. On the NEW website have over 100 NEW Die Cuts AND a NEW section called GREAT DEALS! Today, each of our Designers will be showcasing some of the NEW DIE CUTS Creative Cuts and More offers! There will be 5 ways to win so make sure you start at the Creative Cuts and More blog to learn how. My card uses the A7 Window Card to create a great "Peek-through" look. the stamps uses are from Club Scrap. The Orange flowers stamped under the greeting were stamped using the Smooch Direct Technique from the October 2009 issue of the Technique Junkie Newsletter. The gorgeous butterflies are from Croppinsville. From here you want to make sure to visit the talented Patti West and see what she has created with the new Creative Cuts and More templates. and don't forget there will be 5 ways to win so make sure you start at the Creative Cuts and More blog to learn how you can win. Weekly Giveaway - Paper Temptress! 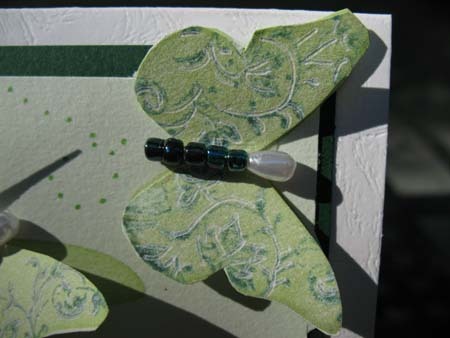 Butterflies in the spring... they lift your heart high, brighten your day, send your spirit soaring. Not much is better -- EXCEPT the $25.00 Gift Certificate from Paper Temptress that is our giveaway today! Patricia from Paper Temptress has generously offered a $25.00 shopping spree to one lucky winner today. 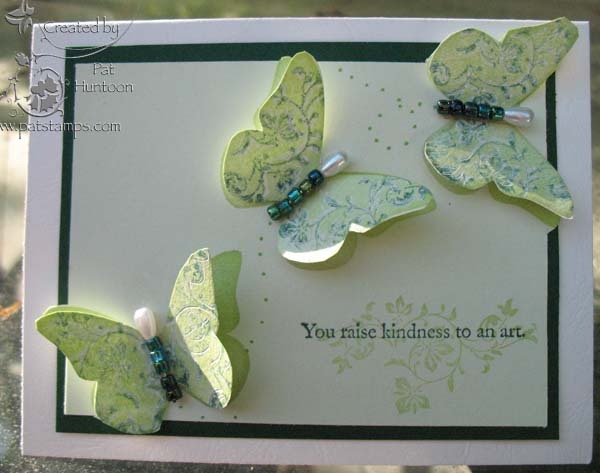 The winner will receive the butterfly card above, and be able to choose $25.00 of Patricia's glorious paper from her store. The butterfly card uses the Kissed with a Twist Technique from the April 2010 issue of the Technique Junkie Newsletter on the wings of the butterflies. These creatures are ready to fly off the beautiful paper from Paper Temptress, don't you think? Remember, Paper Temptress always offers 15% off to Technique Junkies with the code tj15 at checkout! If you are a Copic Marker lover, you MUST try the Crygen Iridescent white paper -- it is dreamy with Copics. The whole iridescent line is 30% off this month, too! To enter this giveaway for the gift certificate and card, simply leave a comment on this post. Make sure to leave enough information -- specifically an email address (try this format: p huntoon at optonline dot net) so that I can reach you. I will pick a winner on Monday, May 10th! You do NOT need to be a TJ subscriber to win this giveaway. Good luck! Congratulations to Beth Cutwright, the winner of this giveaway!